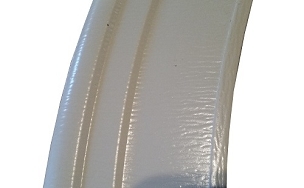 Aluminum half round window trim manufactured to match your other window wraps. Our HRWT machine will curve and arch the aluminum trim coil to the rounded shape of your half round window. 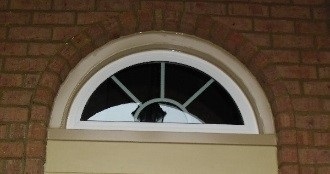 This half round window trim has a smooth face for installers who like box end window wraps. It comes in a simple L-shape for installing inside a brick opening and a C-shape for outside siding. The C-shaped has an added 3/4 inch turn back around the top of the window trim to seal off at the wall exterior. Do not add or subtract from your measures. It is rare to measure wood trim for a perfect measure. Our HRWT machine will cypher the measures and create a good fitting aluminum half round trim piece for your arched window top. I do a lot of windows and hate hearing the customer cuss me out about that half circle trim not being wrapped. Thank goodness I found yall. Now when I finish the windows they are finished and the rounded ones are finished in yall's round window trim. It's gotta fit in the hole. I measured too big and thought I had really messed up. I called Onyx Xteriors and they had the answer right off. Thanks for saving my but. I thought I had to reorderÿand wait for it. After all my hard work my customer brings me a picture of this. I could have just ordered it. Well I did end up ordering it. The customer was not fond of how much caulk I had to use to get mine to stay in place and then he said I could clean the mess off while I was waiting on a trim piece. He was a ornery old cuss but he was right. I trimmed the bottom of the trim and slid it right on. As much as he got on my nerves he taught me something too. Now I don't argue, I just keep my mouth shut and order what I need. I get my vents and round window trim and collector heads here. They always look great.